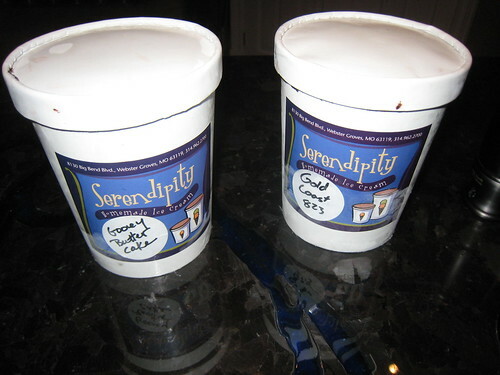 If you’ve forgotten what truly amazing ice cream tastes like, you should try some Serendipity ice cream. It’s made right here in St. Louis, and it is just exquisite. 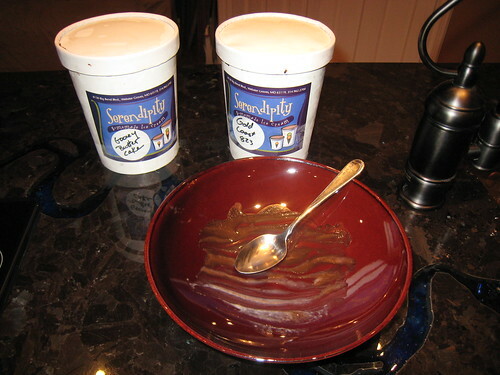 We’ve been eating the Gooey Butter Cake ice cream and the Gold Coast (double chocolate) flavors. I am not kidding when I say that we have been serving it in our shallow bowls. So we can literally lick them out once we’re done. It is that good. We buy ours from Local Harvest which is a long walk (or easy bicycle ride) from our house. If you have the opportunity I completely recommend this delicacy. This entry was posted on Monday, September 10th, 2007 at 12:30 am	and is filed under Food, Pictures, Reviews. You can follow any responses to this entry through the RSS 2.0 feed. You can leave a response, or trackback from your own site.